I’m using the Cintiq32 Pro. Sometimes I get this low power warning. Tablet driver: “Warning ‘low battery power’: If you want to keep using your wireless device, you need to connect it to a power supply immediately. 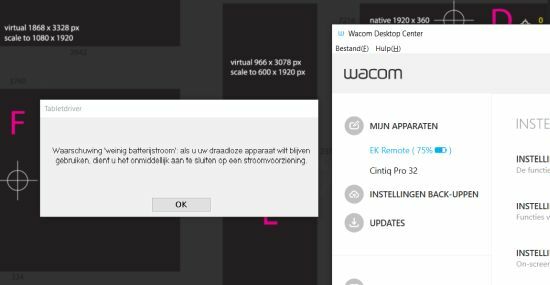 Re: Cintiq32 Pro Low power warning? There could be a temporary issue with the connection causing the driver to think the battery of the EKR is depleted. Try doing a reset of the remote and moving the dongle from the back to one of the side USB ports.